Three new CO2 laser-cutting machines joined the ranks at custom metal fabricator Reflex Industries, Elkhart, IN, in 2008. That’s when the fabricator, born just nine years earlier, moved from its original 70,000-sq.-ft. shop to a 125,000-sq.-ft. plant. Then, still riding a wave of rapid growth, Reflex added (in 2010) its fourth 4000-W CO2 laser-cutting machine to its stable; it also operates 1500- and 2500-W CO2-laser cutting machines. Along the , since 2012 Reflex, a supplier to the recreational-vehicle, travel-trailer and utility-truck industries, among others, also has added four new press brakes and three turret presses. 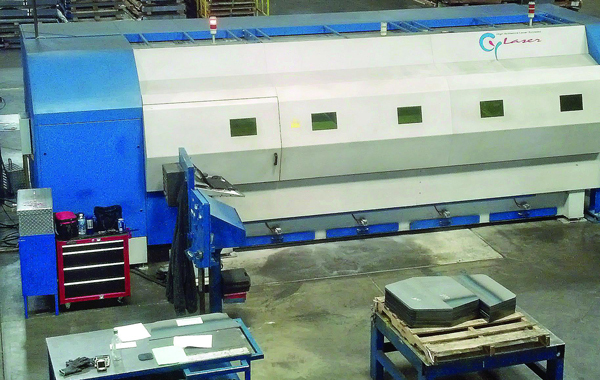 Reflex has acquired several pieces of metal-fabricating equipment in recent years, including this Cy Laser 2.5-kW fiber-laser cutting machine. The side-loading dual-table machine design is noted by Cy Laser for its compact footprint, ideal for limited-space applications. Its latest laser acquisition, though, has become the apple of engineering manager Chris Heffner’s eye: a 2.5-kW fiber-laser cutting machine. The side-loading setup, from Cy Laser, Geneva, IL, provides a maximum cutting-feed rate of 1200 in./min., positioning accuracy of ±0.001 in., and can carve through carbon steel to 0.70 in., stainless steel to 0.32 in. and aluminum to 0.40 in. Cy recommends the side-loading dual-table machine design, noted for its compact footprint, for limited-space applications. Most of the work Reflex runs on its new fiber laser—and the machine runs around the clock—is aluminum from 0.10 to 1/8 in. thick, to support the firm’s market push into the utility-truck market for end-use OEMs such as FedEx and UPS. Most of the work Reflex runs on its new fiber laser is aluminum from 0.10 to 1/8 in. thick. The machine can cut aluminum faster than its 4000-W CO2 laser can, and consume half the wattage. Shown are aluminum parts 0.10 in. thick (below) and 0.125 in. thick (left) that the 2500-W fiber-laser machine cuts at 200-250 in./min. However, for Reflex’s management team, justifying the investment in what Heffner calls “relatively new technology” came down to increased speed and decreased energy costs. Back in 2011 when Heffner began to look for a new laser-cutting machine and turned his attention to fiber technology, he became convinced that a fiber laser would create savings for the company. Once the machine landed on the shop floor, he focused on convincing management that the claims by Cy Laser as to the power savings were true. So, he hired an electrical service company to put meters on one of the firm’s 2500-W CO2 laser-cutting machines and the new fiber machine, and ran the machines side by side on the same material types and thicknesses for one week. 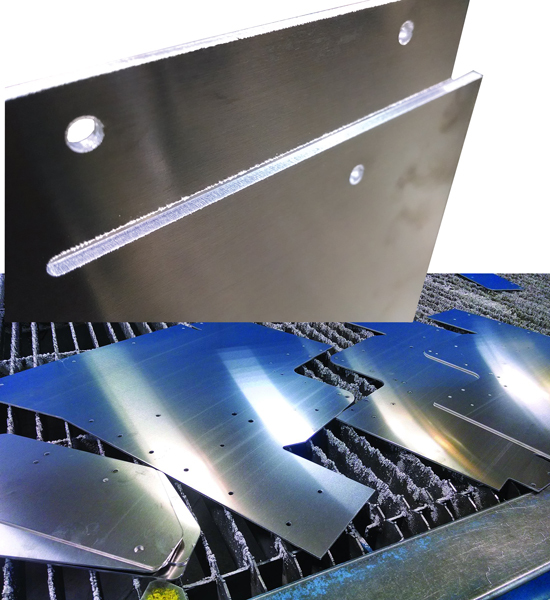 Along with the new fiber-laser cutting machine came nesting software from Lantek—“an upgrade from what we were using before,” says Heffner, who oversees much of the firm’s part-design and programming functions. “We’ve gone ahead and incorporated the Lantek programming software into all of our laser-cutting machines and our turret presses, using the appropriate post processors. Estimating the net savings, to satisfy management, from reduced maintenance and power costs “amounts to tens of thousands of dollars per year over three shifts,” says Reflex Industries president Robert Heffner. That has the company contemplating adding another Cy Laser fiber machine to the mix, to replace an aging CO2 machine.